These grand courses are offered by UCT School Development Unit in December - Internet Basics, Google Earth for Educators and Interactive Whiteboard for Maths Teaching. Have a look. In a previous posting I indicated that one should go over old examination papers before the big exams. I will now add go over old examinations papers in the venue which will be used for the examinations. Exams have to have questions on a specific set of skills so exam papers ask those skills. So those skills should be practised in the venue where the exam will be written to check if the computers ‘can’ answer the questions (as well as checking learners’ skills). Most computers centres have some or other feature which is unique to them and although they may be re imaged before an examination, I always suggest ‘use’ the centre, test it. And after this question, I suggest practicing mail merge with different versions of Access and your version of Word. Have a look at how to solve the question. 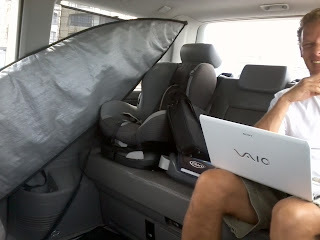 Laptops are mobile and allow one to work where ever. Family men have to work but also want waves so this man has the laptop with him while waiting for the right waves. Such a good illustration. One of the benefits of this blog is that you can comment Anonymously or by using your name. How did the examinations go? How did the September paper set by Study Opportunities help prepare learners for the final examination? Looking forward to seeing responses. We teach such a useful subject! This week the local librarian was telling everybody about her fear of an assessment which she will be doing this week on Email. Mmmm – about not using capital letters for the whole email, how to reply, etc. I listened and tried not to brag about what a valuable subject we were teaching at school. Have a look at the file which I used at an adult course about email. I had the pleasure of attending the awards evening of the Computer Applications Olympiad at Kelvin Grove Newlands tonight. The finalists were a lovely bunch of young people from across the country. Well done to the Computer Society of South Africa for arranging the Olympiad. Congratulations to the finalists! Today are the finals of the Computer Applications Olympiad! Good luck to all contestants!